As the e-reader market heats up, Amazon is trying to stay ahead of the competition with the international launch of its bigger Kindle DX. Amazon will release the new model, with a 9.7-in (25-cm) screen, on 19 January in more than 100 countries. It was launched in the US in May last year. The move follows the introduction of the latest 6-in Kindle in October last year - it ships to 130 countries. Research predicts 10m e-book readers will be sold in the US this year. "The time for invention in the technology of reading containers has come," said Ian Freed, vice-president of Amazon Kindle. "There will be many winners in this market and we think it's a really great opportunity for us to keep being at the forefront of that invention. 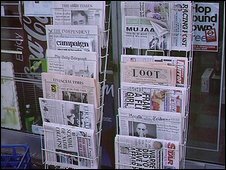 "We may have come up with some things no-one else has come up with, like 60-second downloads and more selections than before, including newspapers and magazines," Mr Freed told BBC News. 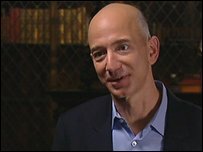 Amazon said it now provides more than 400,000 books and 100 newspapers and magazines on the Kindle. E-book readers will be making a big splash at this year's International Consumer Electronics Show (CES) in Las Vegas. In recognition of the growing market for these devices, CES has set aside specific exhibition space for companies to demonstrate their products to thousands of journalists, bloggers and analysts. "Expect to see significant offerings in the e-reader category over the next few days," said Shawn DuBravac, director of research for the Consumer Electronics Association (CEA). 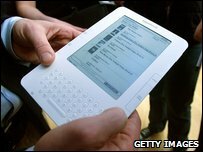 The CEA has forecast a doubling of sales of e-readers for the next couple of years, growing to 16m by 2014. Ahead of the opening of the world's biggest consumer electronics show, Hearst publishing company has brought out an e-reader called Skiff, with an 11.5-in flexible touch-screen that the company claims has the highest-resolution display to date. Also on the horizon is Plastic Logic's Que, which has a 10-in diagonal display. Spring Design's Alex e-reader, with a 6-in screen, has just contracted with Google to access more than one million Google books. There will be new COOL-ER e-books from Interead and Ray Kurzwell, an inventor and futurist, will debut a colour e-reader interface at CES called Blio. The eDGe, from enTourage Systems, tries to blend the idea of a tablet computer and e-reader with a device that has two screens which can fold together like a book. "There are too many designs sloshing around," said Eric Savitz, of Barrons.com, a financial magazine. "Some of these e-books are going to flame out before they get off the ground. And in any case, all of the rules in this market could be re-written when Apple unveils the tablet (computer) later this month." "I think a lot of companies that are building different products are just adding features for the sake of it. We are focusing on the features, capabilities and experiences that work for the customer," he said. Amazon seems to feel it has a product that will survive the glut of devices due to flood the market. The e-tailer said that throughout 2009, the Kindle was the most-popular present in Amazon's history. Forrester Research estimated that Amazon accounted for 60% of e-readers sold in the US last year, followed by Sony with 35%. Amazon also revealed that it sold more e-books than physical books on Christmas day. Mr Freed told BBC News that this trend spells the end of physical books. "If you were a reporter 700 years ago, you would have said the scroll will never disappear because it is a good technology. Then someone came along with the physical book and it changed everything," said Mr Freed. "I think the same thing is happening here. The only question is does it take three years, five years or 20 years?"